FLVS is excited to join the nation in changing classrooms everywhere through digital learning by participating in the third annual Digital Learning Day. On February 5, 2014, this event will bring together educators and students to celebrate digital teaching and learning practices that can enhance our children’s educational experiences, and encourage everyone to take a pledge to support full integration of digital learning into our students’ lives. Let’s start the wave by having you take a small plunge into Google+ hangouts with FLVS! We have an exciting event planned on February 4 at noon where we will host a Digital Learning Q&A through a Google+ Hangout on Air (HOA) with our 2014 Teacher of the Year, Shawn Wigg. A Google+ Hangout on Air is like an online talk show – it’s a place to host interactive video conversations for free, then save them for later viewing. Head over to www.google.com/+floridavirtualschool and click “Follow” to get updates and more information about this great event. If you can’t make it to our HOA, FLVS is offering several events in conjunction with Digital Learning Day. 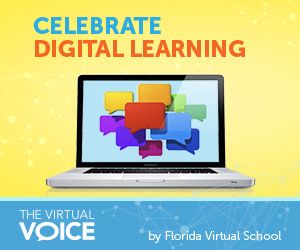 Click here and search by “Florida Virtual” to view our events, or celebrate by using FLVS resources to digitize your classroom through the FLVS Study Hall videos on our YouTube channel. Don’t forget to visit the Digital Learning Page resources to jumpstart your classroom in celebration of Digital Learning Day with great ideas and lesson plans. Let’s come together to make a difference in getting access to digital learning for every child, making a profound difference in all of our futures. This entry was posted in Educator Edition and tagged 21st Century Education, Digital Learning Day, Digital Resources, Google Hangouts on Air, innovation, Student Success on January 29, 2014 by Guest Blogger.